"See here's the problem," I tell Susan, as we're sat in front of the television watching Run Fatboy Run, with our dinners on trays on our laps. "I've been eating too slow and watching too well. My macaroni cheese has gone cold." "Stick it in the microwave," she says, without looking at me. "Normally that would work," I tell her. "Though chips don't come out as tasty as they went in. But I've also got salad on my plate, entangled with the pasta and chips. When you microwave lettuce it goes limp, warm and slimy, like a politician's handshake." She lifts the remote and presses the pause button, then turns slowly to stare at me. "Do you want to watch this film?" she asks. "Or talk drivel about salad?" "I was planning to do both," I say. "But I can see now that's not going to work. Press play." She does and we see the novice runner Dennis getting his giant blister pricked by his mate Gordon. It's such a well-acted scene that it makes me laugh every time, as the tension builds to the pus-in-the face climax. I still have my pasta problem but a solution has come to me. Five minutes later I'm back from the kitchen. "Did your need for hot pasta overcome your dislike of limp lettuce?" Susan says. "No, it's too horrible," I say. "So I picked out all the bits of salad with my fork and ate them, then I microwaved the chips and macaroni, then I added more salad from the bowl. Quite clever actually." "Yeah, you're a mastermind," she says. "Took you ten minutes to outwit lettuce." She presses the pause button again and I stare at the frozen figures, unwilling to turn and look at her, as I can sense what's coming next. "So are you going to wear a kilt at Mairi's wedding then?" she says. "How many times are you going to ask me?" I say. "As many as it takes you to get the answer right," she says. "I'm not going to wear a kilt," I say. "I've never worn a kilt and I'm not starting now. It's fake Scots culture that projects a quaint, kitsch caricature of us to the world. It also has martial overtones which I hate." "Men in kilts make women go weak at the knees," she says. "What would I do with a wobbly-kneed woman," I say. "You used to know," she says. "Listen," I say. "The last thing I need is to enhance my allure. I have to work hard to tone it down or women I've never met sexually harass me in the street." She shakes her head. "It's a strange planet you live on, Douglas. The entire wedding party is wearing kilts. You'll look out of place in a suit." "I'm not part of the wedding party," I remind her. "The groom's mother has vetoed it. So I'm to be banished to the boondocks, perched on a bar-stool at the back of the hall with a small telescope to see what's happening." "You're at the table right next to us," she says. "Brian's wearing a kilt." "He is not," I say. "He is. Told us yesterday. So that's the full set. Except you." It's my turn to shake my head. "Brian? Well, that's disappointing. I had him down for a man with a backbone like mine, impervious to pressure from strong women." "He is," she says. "He just knows when to relent to make people happy. Doesn't make him less of a man. More, if you ask me." She pauses then plays her trump card. "Marie says you'll look lovely in a kilt and would you please wear one for her." Marie is the bride. Girly, gorgeous, funny and feminine. I've had a soft spot for her since we met. "Oh for heaven's sake, all right," I say. 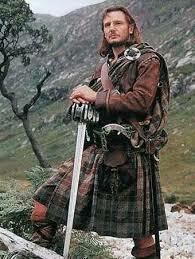 "I'll wear a bloody kilt. But don't expect me to enjoy myself. It'll feel like I've betrayed my principles. I'll be hot and uncomfortable. I won't know how to sit down, dance with decency or take a leak. And I'll get groped by all the gays." "You'll love it," she says. "There's just one more thing." I turn to look at her and my mind goes numb with sudden dread. "Marie has found these gorgeous pink sporrans in a wedding catalogue ... "